As organizations start looking to the cloud, a common option is to utilize a hybrid cloud approach. 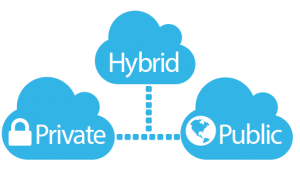 A Hybrid Cloud is any combination of internal private cloud, external private club, and public cloud services. With this approach you have the flexibility to keep running some applications in your data center, moving some to a private cloud, and also using some public cloud services. Balance the use of internal and external assets. You can deploy business systems in your private cloud on premise, and move them to your private cloud off site when the demand for processing resources outpaces your on premise solution. Mission-critical applications can run internally or in your private cloud environment and have full disaster recovery available in the public cloud. If your systems experience a problem such as a power outage, the servers in the public cloud can handle the workload. Hybrid cloud computing can allow you to balance security, cost and scaleability by choosing different environments for different workloads and requirements. Moving to a cloud environment allows the company to know exactly what computing resources are being used by which department. This allows you to bill back services to the appropriate business unit. Private Cloud – On Premise First! For a company to effectively deploy a hybrid cloud solution, a private cloud, on premise solution should be deployed first. Starting with a highly virtualized environment driven by a robust cloud management platform can mean the difference between a smooth transition or a costly endeavor. Think of this process as a highly orchestrated performance which requires meticulous attention to detail and contingency measures. 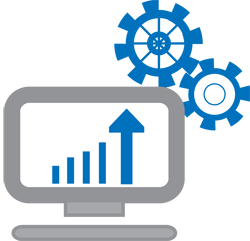 Our Cloud Readiness Assessment will contain an in depth examination of your network environment and business systems. Our engineers will study your organization’s demand for computing resources, establish which services are most appropriate and build a transition plan that will allow the transfer of your data and systems with zero risk of data loss, guaranteed!